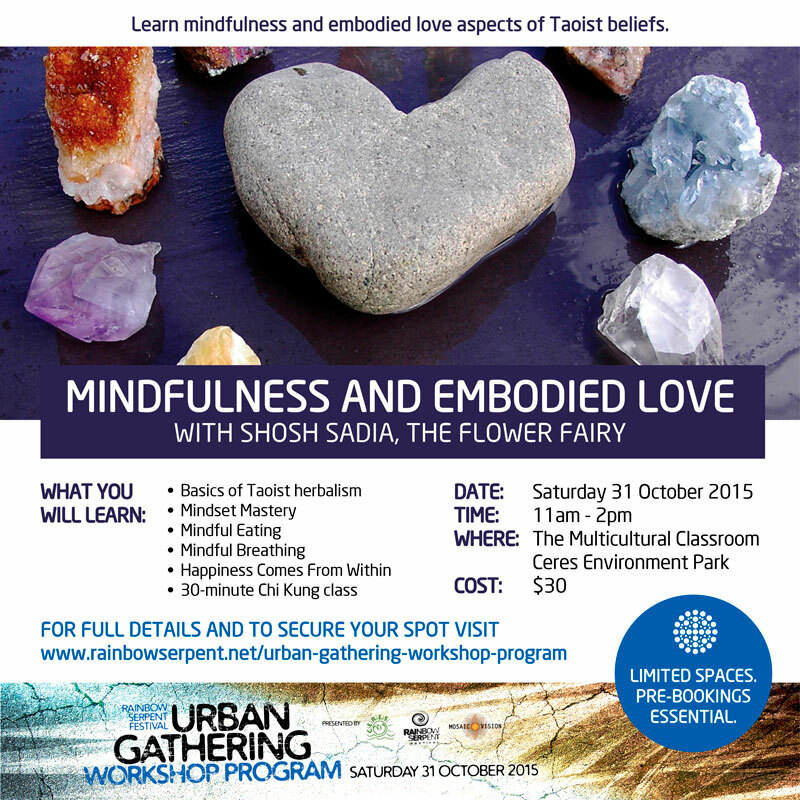 In this workshop, Flower Fairy, a holistic health and wellness coach, personal trainer and workshop facilitator will be teaching mindfulness and embodied love aspects of Taoist beliefs. You will be educated on how to create a morning ritual – Lots of wholesome, fun, quirky and easy ideas will be provided to make your own morning ritual, so you can start your day calm, empowered and with a spring in your step. Basics of Taoist herbalism – The numerous benefits that Taoist tonic herbs can have within our modern day society will be explored as well as some wonderful recipes and a tonic elixir demo. Mindset mastery – You will be armed with tips on how to have consistently high energy through choosing how you perceive the world and your circumstances. The workshop will also include a 30-minute Chi Kung class, a gentle happiness guided meditation. Parts of the workshop will incorporate nutritional advice to holistically capture and communicate the fullest enjoyment and relationship of body and mind. How to Create a Morning Ritual – Lots of wholesome, fun, quirky and easy ideas will be provided to make your own morning ritual, so you can start your day calm, empowered and with a spring in your step. Mindful Eating – You will be guided on how to make peace with your plate and how to have optimum digestion around meal times. You will also be taught how to use your own intuition and inner guidance to know which foods are best for your individual needs. Mindful Breathing – Flower Fairy will enlighten you on the benefits of breathing and how to incorporate a breathing practice into your daily routine. The quality of the air we breath, as well as how to breathe properly and fully for maximum energy will also be discussed. Happiness Comes From Within – You will be provided with exercises and a tool kit to enhance your happiness journey. This will include inspirational quotes, reverse bucket lists, gratitude practices and much more. We will also touch upon how to live up to your true authentic self. The workshop will also include a 30-minute Chi Kung class, a gentle happiness guided meditation and a tonic elixir demonstration with samples.